Kennebunk's Will Jones makes his case for an ordinance restricting the use of balloons in town during a selectmen's meeting in this August 2018 York County Coast Star file photo. 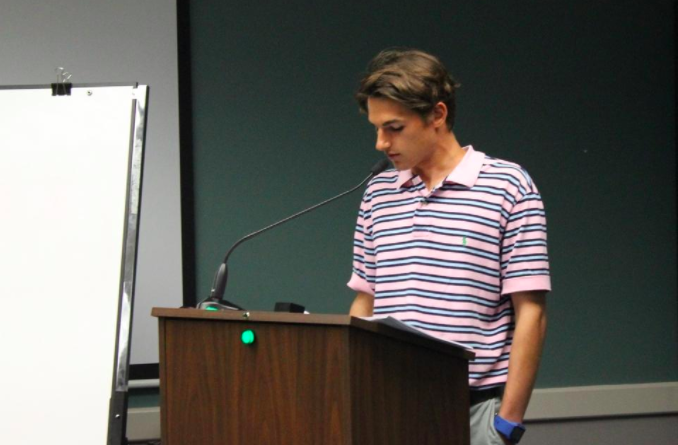 Kennebunk High School senior Will Jones has been a tireless advocate against pollution that harms marine life since he was six years old. His efforts to educate the community have led to a proposed ordinance prohibiting the release and outdoor display of balloons that will go before voters in June. Several community members showed early support for the ordinance at Tuesday’s meeting, including Mimi Hoff and her daughter Arianna. “We consistently pick up balloons on the beach, and it makes me really sad that it’s not considered littering. Thank you, Will for all you have done, and I think together we can raise our children to have a different level of consciousness and learn about all the wonderful alternatives there are to celebrate,” Hoff said.